Composite Advantage has developed a new line of standard size fiber reinforced polymer (FRP) trail bridges. 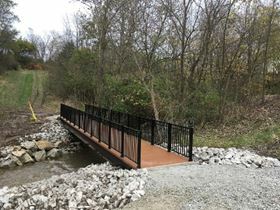 Composite Advantage has developed a new line of standard size fiber reinforced polymer (FRP) trail bridges that have a zero maintenance option that reportedly lasts up to 100 years. Based on the supplier’s FiberSPAN-T trail bridge first installed in 2008, the standard FRP system comprises a prefabricated FRP composite deck with weathered steel beams and powder-coated aluminum railings to resist salt, water and chemical corrosion. The bridges are available in sizes 20–50 ft and meet American Association of State Highway and Transportation Officials (AASHTO) guide specifications for pedestrian bridge designs. They have a non-slip surface which supports safe foot traffic and lasts five to six times longer than traditional sand-in-paint finishes, the company says. It is available in colors that include brown, green and grey. The bridges arrive on-site fully assembled so installation can take just one day. ‘Our new standard line of prefabricated bridges makes selection easier for customers, shortens lead times, and reduces costs with production efficiencies,’ said Scott Reeve, president of Composite Advantage. This story uses material from Composite Advantage, with editorial changes made by Materials Today. The views expressed in this article do not necessarily represent those of Elsevier. Composites UK has published a document entitled 'FRP Bridges – Guidance for Designers'.